I have been meaning to post about Charles Dickens recently, but I’ve been a little busy reading about Hegel. I have also been distracted by Rumi. I love his poetry so infinitely much. I don’t own any Rumi collections, which makes me sad. I tend to go into bookstores with people, and I think buying Rumi is such an intimate act that I don’t want to share that with someone else. To me, it’s like sharing something so intrinsic. I find buying books to be very intimate; it speaks to the words you want to swim in your head, the voices you want to tell you things, and the stories you want to collate in your being. Last year, I almost bought a Rumi collection, but I purchased a wicked copy of The Iliad instead. I mean, it’s not a bad choice! In a game of Would You Rather, I think that could, potentially, be a deal breaker. Do you chose Homer or Rumi? What DO you do? So, I chose Homer, and I can’t say I regret that decision because I knew that I needed Homer at that moment in my life. There was a battle raging in my mind, and Homer gave me the tools to watch how battles can be glorious and well-fought but that your hero will die. Well, that was the aesthetic of the time, the hero must die for it to be considered beautiful and tragic–a sublime melancholy. J.K Rowling showed us the hero just needs to love and “DO” out of love for our fellow humans, beings (of all creatures), and earth. But, now, I think it is time for Rumi. To me, reading Rumi reminds me of sinking into the most luxurious, healing bath water. I should explain this metaphor a little further. I am a water person. When I was little, other kids would play with each other during fun-swims, but me, I would go to the deep-end and swim as deep as I could. I’d swim under all of the feet of the swimmers, like their feet were seaweed leaves swaying at the surface. And, in my own underwater world, I’d live. I swam with dolphins and mermaids; I solved mysteries of life; I was. That sense of being complete is what I feel when I’m in water. Two years ago, I swam in Lake Ontario. I have been in lake water before, but never in such a large, uncertain body of water. I used to always stare at the water, and I’d watch the ripples grate into each other, a perfect infinity. Being in the water epitomized the intellectualization of a vast infinity. When you look into infinity, you admire its presence. When you are within it, the forces of the other, alien forces, push you and desire you to become part of that system. Like being really tiny in an average-sized tub of jello, you are thrust back and forth, bouncing. 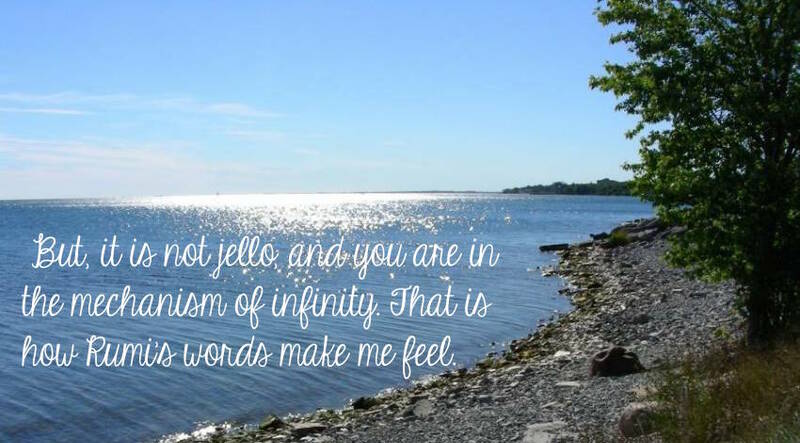 But, it is not jello, and you are in the mechanism of infinity. That is how Rumi’s words make me feel.